Nolan Has the Glenn Procedure | Half Heart. Whole Life. ← What Do You Mean “He’s Not Available”?! On July 17, 2013, after all his necessary pre-sugery work, we brought Nolan to Levine Children’s Hospital. I was pretty tense. Deep down, I knew and had faith that everything would be ok, but there was also the memories of the long recovery last time, with all its ups and downs and the fear that came with it. Luckily for us, Bekah’s college roommate Arianne came to stay with us and support us through this time. It was good to have someone there. We took Nolan to the same room that he was in before his cath. They took all his vitals and we worked on keeping him happy. At this stage he was such a smiley little guy and whenever he was happy, be would kick his feet rapidly: I called it the Happy Bike. The anesthesia team came in to meet us and chat with us a little bit about the procedure. From there we prayed for our little guy and then it was time. If you remember from way back in this blog, I talked about us walking with the nurses all the way down to pre-op with Nolan before his Norwood Procedure. We wouldn’t be doing that this time, and I wasn’t sure why. Instead one of the anesthesia team members held out his arms and I handed over our 7 month warrior…my hero…to be cut open for yet another time. While I was clinging to the faith I had, it was no less heartbreaking to see my little guy go. Next, though, it was time to go to that stupid waiting room that I hated so much. We checked in with the lady at the desk and saw that another of our friends, Karen, was already in there waiting for us. It was quite the surprise because we weren’t expecting her. It’s always good to have company during this stage. And just like the first time we waited: we talked, we read, we watched tv, surfed the interweb, stared off into space. And periodically we’d get updates from the O.R. : anesthesia was completed, the first incision made, everything’s looking good, etc. Finally we got word that the procedure was complete and that Nolan was doing well, but it would be a little bit before we got to see him. I took that opportunity to go to our favorite Malaysian Restaurant to pick up some lunch. We ate and were very happy, but we were dying to see Nolan. Finally we were allowed up to see him in the CVICU. It was crazy being back on that floor with its familiar sights and sounds and people. What was different this time was that Nolan was doing AWESOME and all those nurses were thrilled to see him and how well he was doing! Nolan was still a little out of it and was intubated, but all signs pointed to him doing well…AND His chest was closed! YES! We held his hand and talked to him as he came to. He was in some discomfort, but he was looking great…even his color was amazing. The nurses and the rest of the heart team were very happy with his progress and the goal was to remove his breathing tube and get him up to Progressive Care within a day. And that’s what happened! Less than 24 hours after surgery, Nolan’s tube was out and we were already out of CVICU, which was bittersweet. Back to Progressive Care, where things were a bit more challenging. This time, though, we knew what to expect. Posted on January 26, 2014, in CVICU, Progressive Care, surgery and tagged CHD, congenital heart defect, CVICU, faith, Glenn Procedure, HLHS, hypoplastic left heart syndrome, Progressive Care. Bookmark the permalink. 5 Comments. I am so thankful I found your blog. Our son was born with transposition and is having his Glenn tomorrow morning. His first surgery was PA band placement and it was so scary. 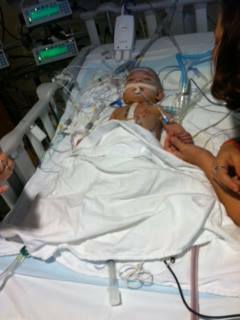 I’m glad to see how well your son did with the Glenn and I’m praying for the same results and to see that breathing tube out quickly! Thank you for your blog. I know you geared it towards dads, but this mom has sure found comfort reading it! Hi Chris! We came home from the hospital yesterday. Owen had surgery on Monday and did very well! We were in awe at how well he did and everything seemed to go so much more smoothly than his first surgery. He seems to have a bit more pain with this one but he’s a lot more active now so that makes sense. As long as we stay on top of the pain with Tylenol, he stays pretty happy. I’m so thankful that this is over with and we don’t have to think about any more surgeries for a couple years! God has been hearing and answering our prayers this week and has given us so much peace about everything! I hope your son is doing well and thanks again for your blog. I will definitely be following it! How is Owen doing? I apologize for the very late response, things have been busy! I’m glad to hear his surgery went well…I know the “Glenn Head” is really rough, especially since it’s different for everyone. Hopefully by now it’s passed and Owen is doing great! He’s doing great! We just had his 6 week postop visit and now we don’t have to go back until August. That will be a nice break! Thanks for checking on us. I hope your little guy is doing well!